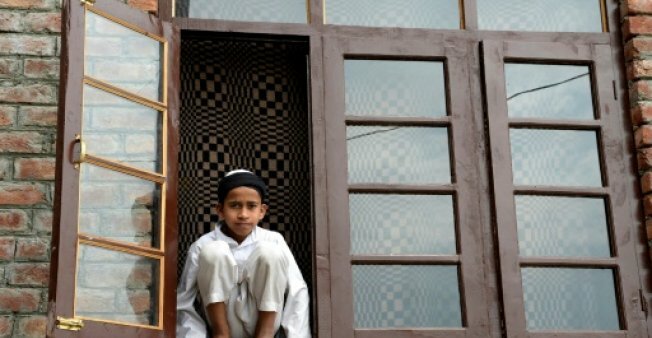 A young Rohingya refugee poses in the window of a building on the outskirts of Srinagar in Kashmir, but is among thousands who could face expulsion pending an Indian supreme court decision. NEW DELHI - Detested in Myanmar, the Muslim Rohingya desperately seeking sanctuary will get a new reminder Monday of just how unloved they are in India too. As the number of Rohingya fleeing a military crackdown for Bangladesh refugee camps races past 400,000 in three weeks, the Indian government is to put its case to the country's Supreme Court for expelling up to 40,000 who have arrived over the past 10 years. According to media reports, the government will argue that the Rohingya are a security threat who could aid terrorists. Civil rights campaigners and the UN High Commissioner for Human Rights Zeid Raad al-Hussein have strongly opposed India's move. And many experts question where India could send the Rohingya even if the government gets Supreme Court backing. The plight of the Rohingya in India, and even neighbouring Nepal, highlights the difficulty the international community faces finding them a long-term home. The Rohingya had been leaving mainly Buddhist Myanmar -- where the government calls them illegal migrants and refuses them nationality -- in steady numbers for years before a deadly August 25 military crackdown that opened the floodgates. While Bangladesh has been the main destination, some have ended up in neighbouring countries, almost always forced to live in squalor. There are 16,000 Rohingya registered in India according to the UN, but many more are undocumented. Officials say nearly 7,000 live in shanties in Jammu in the Indian Himalayas, where they started arriving in 2008. Jammu itself is Hindu majority but is part of the same Indian state as neighbouring Kashmir, where India is fighting Muslim separatists -- which is what worries the New Delhi government. The Rohingya in Jammu mostly survive by collecting plastic rubbish for recycling or as labourers. They say the hostility there is overt. The ruling right-wing Bharatiya Janata Party in Jammu has sought court orders to evict them from the state. One business group threatened to kill the Rohingya if they were not moved. Last week a dead cow was found near a Rohingya settlement on the edge of Jammu city. According to Shafi Alam, a Rohingya who arrived in 2008, Hindu activists torched shanties accusing them of killing the cow -- a creature sacred to Hindus. "Earlier there was not much of a problem, but hostility has increased a lot since the cow incident. We fled from there and now about 100 families live in the open air," Shafi Alam, 52, told AFP. In New Delhi, there are 47 families living in dilapidated rooms at Kanchan Kunj camp. They say they would rather suffer there than return to the hell of their former lives in Myanmar. The residents include Mohammad Salimullah, a grocery store owner and one of two Rohingya petitioners challenging the government at the Supreme Court. "Back home, our chickens were kept in bigger accommodation than the ones we're living in now," he told AFP. But he said government and police officials have always offered help and he declared "full faith" in the Supreme Court. "I would rather have the government kill us or put us in jail than have us deported back there (Myanmar). "If we go back there, they will cut us into pieces and stack us 10-15 people together and set us on fire." In neighbouring Nepal, about 250 Rohingya live in a slum of shacks in northern Kathmandu, anxiously awaiting news of relatives fleeing Rakhine. Rafiq Alam, 28, who arrived with his wife and two sons after violence in 2012, said his home village "now looks like a field. They burnt the whole village and reduced it to ashes." The Nepal government has no plans to take action against the Rohingya, though the community does face harassment and struggles to find work. Nepal is also attempting to prevent more Rohingya arriving. "Nepal has increased surveillance at its border to stop more Rohingya from entering the country after the Rohingya crisis in Myanmar because we cannot bear any more crisis," home ministry spokesman Ram Krishna Subedi told AFP. Nepal is still rebuilding after a devastating 2015 earthquake and recent floods. Despite their fears of Buddhist mobs in Rakhine, some Rohingya still say they pine for home. "At the end of the day, this is a foreign land for us," said Salimullah in Delhi. "I do feel like going back home sometimes because our parents gave birth to us at home. But kids here, they are born on the streets, in the slums. What will happen to their children? "And when they do grow up, they won't be able to say 'this is my home, this is my country'." Detested in Myanmar, the Muslim Rohingya desperately seeking sanctuary will get a new reminder Monday of just how unloved they are in India too. As the number of Rohingya fleeing a military crackdown for Bangladesh refugee camps races past 400,000 in three weeks, the Indian government is to put its case to the country's Supreme Court for expelling up to 40,000 who have arrived over the past 10 years.